A signed, limited edition, digital print (100 in total) taken from an original oil painting. 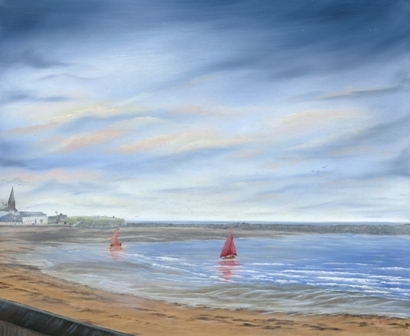 Showing the beautiful bay of Newbiggin by the sea in Northumberland, with its flowing curve and lovely sands. The church stands high on the point overlooking the maritime museum and cafe. Two sailing boats set out in the sunshine of this lovely summers day. Comes with a Certificate ofr Authentication on the revers.